HOW MANY 12 FOOTERS DO YOU SINK? If you want to neglect your alignment on the Tee box then you can probably get away with it most of the time, but by the time you get to the green, alignment has become critically important. It’s not a 20 – 30 yard target now; it’s a 4½ inch target. A study of over a thousand golfers found that on a straight 12 foot putt, the golfers, all with a handicap of less than 24, lined up with an aim that would miss the hole over 43% of the time. When a marker was placed at 6 feet, between them and the hole, the same golfers improved their accuracy of alignment from 57% to 68%. That’s a big improvement, but it still means that our test golfers were aiming to miss on 34% of their efforts. That’s a lot of missed 12 foot putts before we get into the putting stroke. What it does say, is that we line up far better the closer the target is. So remember when lining up the putt, find a point 3 to 6 feet away that is down the middle of the line you want. Then line your Putter head up square to the line you want to start the ball out on. As you setup though, remember it’s not just your Putter that must be setup on the correct line. Your shoulders and your elbows must be lined up parallel to the line you are starting your putt on. It doesn’t matter if your feet are open or closed, your elbows and your shoulders must have a line through them both that is parallel to the target line. 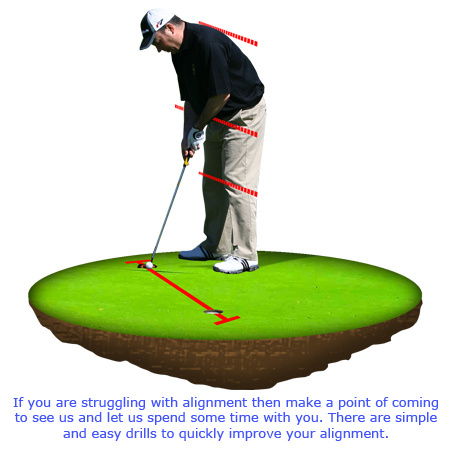 Of course, part of the problem of alignment is lining up the Putter face at 90° to the target line, to ensure a square face that will set the ball down that line. Manufacturers have been working to solve that problem. This entry was posted in golf, golf tips, sports and tagged golf instruction, golf lessons, golf plane, golf swing, putting. Bookmark the permalink.